S9.E03 :: Kerplink! Kerplonk! Kerthulhu! Tower of Madess designed by Curt Covert from Smirk and Dagger Games is a mash-up of Kerplunk and Elder Sign. This game is a prototype that has not yet been produced but absolutely should be produced. It is light and silly chaotic fun set in the world of Cthuhlu. Each player takes on the role of an investigator trying to score the highest roll to win the location. Players roll 5 dice on their turns. Each die roll has 3 required results (a gate, a sanity, and a stamina) and 2 results that determine the winner of the location. If a player fails to roll the required results, he or she will have to draw a horror (tentacle stick) from the maddening tower of the elder ones. Marbles may drop from the tower. Blue marbles score victory points, clear marbles allow the player to draw spell cards, and red marbles may make a player lose his or her mind. The game continues until either all locations have been successfully investigated or if 3 doom marbles have dropped from the tower allowing Cthulhu to devour the world. Our discussion focused on Curt's inspiration for this game as well as the production challenges he anticipates as he tries to move forward with it. 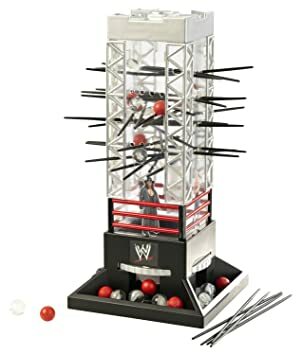 The prototype is made from an altered WWE Kerplunk tower, so there are many practical considerations that a small publisher must factor into any decision to create a game like this. If you wish to learn more about Smirk and Dagger games, please visit their website. This game is not available yet, but check the company's website or keep your eyes on Kickstarter because you might see this game one day. The Supershow is a high-intensity, unpredictable card game like the exciting world of the wrestling that it draws its theme and mechanics from. The game bills itself as the world's first UCG (unpredictable card game). Players choose to compete as wrestlers from the Legendary Fighting Federation in the SRG Universe or as real life wrestlers from the independent circuit to see who is the best in the ring. The base game comes with 2 wrestlers and 2 base decks, but each wrestler has his own special gimmick power and 3 finishing moves to inflict on his opponent. At the beginning of each turn players roll dice and check the symbol against their stats. The winner draws a card and may play a grapple, submission, or strike. Be careful, these cards can be countered, which might give the opponent the upper hand. Once a player has a lead and follow-up move on the table, he or she can attempt to pin the opponent. The match is still not over as the opponent has 3 die rolls to match whatever the is rolled by the player who applies the finish. The unpredictability of the game keeps all players invested in the action much like a live wrestling match. This game has been a blast to play both as a fan of games and a huge fan of wrestling. Our discussion focused on the origin of the idea for this game and the process behind its creation. We learn that this game has a connection to the Tops Trading Card Company. And finally, we discuss how the world of professional wrestling has responded positively to the idea of a game like this. If you would like to learn more about this game or buy a copy, please visit the SRG Universe or its Facebook page. If you are local to the Queens area, the Supershow is putting on an event before a wrestling show in Jamaica, NY. Please visit the links for more information.